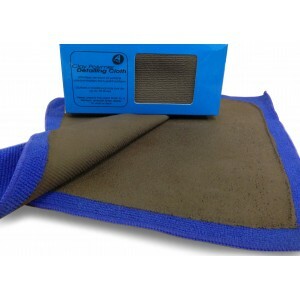 NEW Microfibre Clay Detailing Cloth now leads the way in Car Cleaning/Detailing Technology. This advanced cloth is manufactured with a rubber polymer technology additive. The Microfibre Clay Detailing Cloth will ensure removal of any unwanted paint finish contaminants, tree sap, bugs, water spots, road tar, industrial fall-out; faster and more effectively than a conventional clay-bar. After usage, simply rinse the cloth with clean water and hang up to dry. The cloth can be used up to 60 times, outlasting up to 10 clay bars.